Czech beads are huge in their variety both in designs and colour - the Czechs have been making beads for a long time and use old fashioned methods. At the affordable end of the market, they offer some very lovely items for the jewellery maker including fire polished faceted glass which is very popular. The pressed crystals are fire polished by reheating until the glass starts to melt. 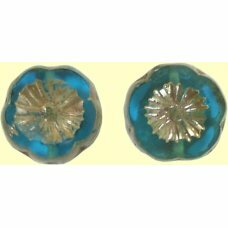 2 Czech Glass Hawaiian Flower Aquamarine Picasso Beads, approx 12mm diameter x 4mm. Hole through top..
1 Strand Tanzanite 8mm Czech Glass Beads, approx 50 beads on a 40cm strand. Beadmaking in Czechoslo..
1 Strand Tanzanite 6mm Czech Glass Beads, approx 50 beads on a 30cm strand. Beadmaking in Czechoslo..
50 Czech Glass Fire Opal Flower Beads; hole through the top of the flower side to side fab colour th..
25 of Czech Class Top Drilled Opaque Orange-Maroon-Grey Leaf Beads - stripy combination of maroon or..
50 Czech glass light sapphire/ aurora borealis colour flat flower beads - the beads measure approx. ..
10 Czech Glass Deep Rose Pink Leaves with brass hanging loop - measures approx. 17x10x5mm inclusive ..
Strand Czech Glass Firepolish Crystal Beads 8mm jet. Approx 50 beads to 40cm strandBeadmaking in Cze..
1 Strand Firepolish 4mm Faceted Citrus Colour Mix BeadsBeadmaking in Czechoslovakia, now Czech Repub..
50 Czech Pressed Glass Dagger Beads - Opaque Turquoise – measures approx. 16 x 6 mm – hole at t..
25 Montana Blue/ Gold Disc Beads; very pretty montana blue one side gold the other - hole right thro..
25 Czech glass faceted firepolish crystal 8mm Peach-Pink-Green - interesting and pretty colour.Beadm..
25 Iris Green Inlay Leaf Beads 8x10mm; vertical hole right through these beads.Beadmaking in Czechos..
CG-317, Strand Firepolish Beads 8mm Clear/ AB. Strand Czech Glass Firepolish Crystal Beads 8mm Clear/ Transparent/ Aurora Borealis (partial coated)..
1 strand 6mm Czech Glass faceted round beads - Strawberry Summer - approx. 50 beads to a strand. Bea..
25 of Czech Class Top Drilled Topaz AB Matte Leaf Beads - matte topaz on one side and matte aurora b..
50 Czech glass green/ rose/ yellow colour flat flower beads - the beads measure approx. 8x3mm. Bead..
100 Czech Glass Firepolish Crystal Beads 4mm Clear/ Transparent. Beadmaking in Czechoslovakia, now ..
1 Strand Czech Glass Firepolish Crystal Beads 8mm Clear/ Transparent; approx 50 beads on 40cm strand..
1 Strand Firepolish 4mm Faceted Taffeta Colour Mix BeadsBeadmaking in Czechoslovakia, now Czech Repu..
50 Czech Pressed Glass Dagger Opaque Aquamarine 16 mm x 6 mm – measures approx. 16 x 6 mm – hol..
50 6mm Heart Beads - Topaz AB - hole top to bottom through the middle of the bead.Beadmaking in Czec..
50 Czech glass 6mm heart beads - amethyst lustre - transparent lustre colour with a coating all over..
100 Czech glass matte medium topaz aurora borealis dagger beads 10x3mm - hole at the top of the bead..
Firepolish Beads 4mm Spring Green; approx 100 beads on 40 cm strand. Beadmaking in Czechoslovakia, ..
1 Strand 3x6mm Turquoise Czech Glass Faceted Rondelles - approx. 60 beads to a strand.Beadmaking in ..
25 of Czech Glass Alexandrite/ Aurora Borealis Leaf Beads; alexandrite on one side aurora borealis c..
50 Czech glass crystal/ aurora borealis colour flat flower beads - the beads measure approx. 8x3mm. ..
CG-287, 100 Firepolish Beads 4mm Light Lemon Transparent/ AB. 100 Czech Glass Firepolish Crystal Beads 4mm Light Lemon Transparent/ Aurora Borealis (partial coate..
Strand Firepolish Beads 6mm Spring Garden Mix; approx 50 beads on 30cm strand.Beadmaking in Czechosl..
50 Czech Glass Cabbage Green Multi Dagger Beads – measures approx. 16 x 6 mm – hole at top of t..
25 of Czech Glass Topaz/ Aurora Borealis Leaf Beads; topaz on one side aurora borealis coating on th..
50 Czech glass 6mm heart beads - dark blue AB - dark blue one side aurora borealis coating on the ot..
25 Peach/ Vitrail Firepolish Faceted Czech Glass Beads - measure approx. 8mm.Beadmaking in Czechoslo..
Firepolish Beads 4mm Peach Rose; approx 100 beads on 40 cm strand.Beadmaking in Czechoslovakia, now ..
1 Strand Firepolish 6mm Faceted Planet Earth Colour Mix BeadsBeadmaking in Czechoslovakia, now Czech..
1 strand 6mm Czech Glass faceted round beads - Turquoise - approx. 50 beads to a strand. Beadmaking ..
25 of Czech Glass Purple Iris Lustre Leaf Beads; base colour is a dark purple with shimmers of blue-..
50 Czech glass lime colour flat flower beads - the beads measure approx. 8x3mm.Beadmaking in Czechos..
CG-284, 100 Firepolish Beads 4mm Metallic Pewter/ Silver (Aurum). 100 Czech Glass Firepolish Crystal Beads 4mm Metallic Pewter/ Silver (Aurum). Beadmaking in Czechos..
Strand Firepolish Beads 6mm Snow Mix; approx 50 beads on 30cm strand.Beadmaking in Czechoslovakia, n..
50 Czech Glass Milky Aquamarine Heart Beads - 6 x 6 mm Beadmaking in Czechoslovakia, now Czech Repub..
25 of Czech Class Top Drilled Peridot-Silver Leaf Beads - peridot green on one side silver on the ot..
25 Montana Blue/ Silver Disc Beads; very pretty montana blue one side silver the other - hole right ..
25 Topaz / Vitrail Faceted Firepolish Czech Glass Beads - measure approx. 8mm. Beadmaking in Czecho..
Firepolish Beads 4mm Spring Garden Mix; approx 100 beads on 40 cm strand. Beadmaking in Czechoslova..
1 Strand Czech Glass Firepolish 8mm Faceted Violet Ice BeadsBeadmaking in Czechoslovakia, now Czech ..
Strand Jet black leaf beads measuring approx 12x8mm 25 beads to the atrand.Beadmaking in Czechoslova..
25 of Czech Glass Peridot Lustre Leaf Beads; hole through the length of the bead detail on both side..